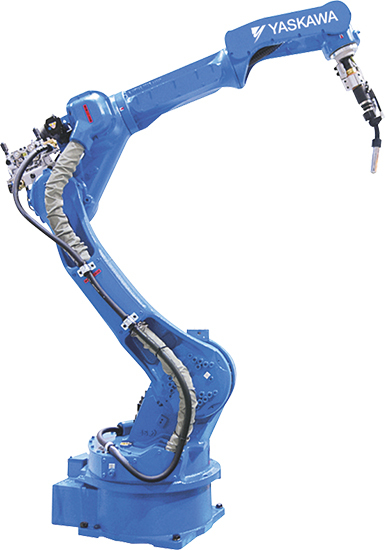 Yaskawa Motoman Robotics, Dayton, OH, has introduced a pair of arc-welding robots loaded with features to optimize fab-shop operations: the six-axis MA2010, (below), with a 10 kg payload and 23-percent larger wrist hole and six-percent longer reach than previous models; and the MA3120 extra-long-reach model—3121-mm horizontal reach, ±0.15-mm repeatability. The MA2010 features a new contoured arm structure that reduces interference by enlarging the close-range motion area of the robot, ideal for welding large workpieces and reaching over jigs. Its hollow upper arm maintains the optimum bend radius of the welding-torch cable. Additionally, the T-axis can rotate the torch ±210 deg. without cable interference. It boasts a 2010-mm horizontal reach, 3649-mm vertical reach and ±0.08-mm repeatability. The MA3120’s extra-long reach arm reduces the need for tracks and proves ideal for multiple-robot layouts. Compared to the previous MA3100 model, it offers twice the payload (6 kg), longer reach and an improved through-arm wrist design for arc welding. Welding utilities (gas hose and feeder signals) can route through the robot base, and the wire feeder mounts to the upper arm to reduce torch length.